Cleaning and maintenance of these buildings require expertise of a different level. There is a huge difference in the procedures involved in cleaning residential properties in comparison to large commercial offices. Undoubtedly, the cleaning of windows in a large commercial setup as in the case of a multi level office block is tougher, challenging and more time-consuming. The task gets doubly taxing if the cleaning is to be carried out in a high-rise or even high low-rise office structure. It quite often involves using a completely different approach. 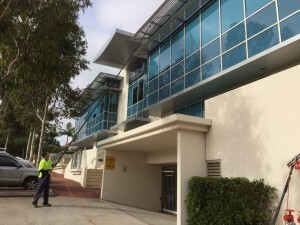 Larger glass-fronted office buildings in Perth have huge windows both as an essential part of their aesthetic, and also as a source of natural lighting. That’s why it’s absolutely necessary to get the cleaning act perfect every single time. Despite commercial window cleaning companies having evolved to the point that they are able to provide an efficient and cost-effective window cleaning solution, the risks involved in cleaning such windows continue to be challenging. For cleaning services to be able to pull off commercial office window cleaning successfully, they must have the most-advanced equipment, tools and tackles that are specifically designed for the task. The office window cleaning professionals must also be extensively trained and have the expertise to do the job, not only efficiently but with minimal risks. They must also use the appropriate professional equipment specifically designed for such cleaning applications. The Perth that we see today is a far cry from what it was about two decades ago. Today it is a major business and tourism center with numerous business and tourism centers. Many companies have set up their headquarters here and that has led to a slew of buildings and apartments springing up across the length and breadth of the city. Perth city buildings are a treat to look at because of their stunning structural innovations and architectural brilliance. Many of these Perth city buildings have huge glass windows and façades that require constant cleaning to maintaining. Perth city continues to grow at a hectic pace with newer establishments and private apartments making their presence felt here. The Central Park building is easily one of the most famous structures in Perth. Standing at 249 meters and with the main roof extending to 205 meters, cleaning the façade of the building can pose a challenge even to the best window cleaning professionals. The Central Park building has 52 floors which means cleaning professionals must incorporate the latest technologies and equipment to get the cleaning job completed perfectly. Brookfield Place is another famous building in Perth City that has a towering presence and adds to the modern look of the city. Located in the City Square Complex, the building is 244 meters in height and is about 35 meters in width. The façade material is entirely made of glass which again necessitates regular cleaning and maintenance. Professional cleaning services with a high level of experience and expertise are required to keep this amazingly sprawling façade look stunningly clean. The Bank West Tower is yet another major structure in Perth City that grabs attention effortlessly. Standing majestically at a height of 247 meters comprising of 50 floors, this is one of the tallest buildings in Perth CBD. The concrete structure has an all-glass façade and is another one of those buildings that can challenge the skills and cleaning abilities of window cleaning professionals. The curtain wall façade system with its dark green color requires special cleaning tools, equipment and cleaning expertise to keep the building in great shape throughout the year. The modern architectural style of the building demands the use of state-of-the-art equipment to reach the façade and ensure a safe and comprehensive cleaning process. The fundamental skills required for smaller offices applies equally to the cleaning of windows in larger office buildings but the equipment used is different, depending on the size, design and height of the windows. The key challenge with tall structures is achieving the height necessary to reach the windows of taller buildings and working at those levels. Cleaning equipment of commercial windows in low rise office structures up to 8 storeys is often now done using water-fed poles. Cherry pickers can be used above eight storeys where there are no access issues and where no BMU’s are fitted. Rope access or abseiling as it’s commonly known is used for commercial office buildings above eight storeys that have structural access issues. The most advanced tools in the category of pure water window cleaning are capable of reaching up to a height of about 25 meters. A skilled window cleaner with professional training can leave a window as clean as those at the ground level. As a bonus, water-fed poles are usually used to wash the frames, seals, and sometimes even the façade and signage at the same time. These days, high-tech equipment specifically designed for cleaning windows in high-rise office buildings are also available. BMU’s or Building maintenance units are colloquially called ‘cradles’ by many Perth window cleaners. These machines are extremely sturdy and are usually designed to carry two window cleaners, all their equipment and other associated paraphernalia. While these are indeed slightly expensive procedures, they can provide cleaning of the highest levels. Make sure you choose a reputed, insured, and experienced commercial window cleaning service for cleaning your office windows. They must have a great track record and must have the skills to handle complex window cleaning tasks with ease. Whether it be window cleaning Perth northern suburbs or Perth southern suburbs, we have the expertise and know how to make your windows shine. Switch your Windows Cleaners in Perth, and contact us for a Free, no obligation quotation on Window Cleaning Perth – cccwindowcleaning.com.au .